Keeping your feet warm these wader socks are made with a wool blend and feature a battery pouch providing 6 to 8 hours of warmth. The battery pouch is detachable so it can be conveniently worn on a belt or kept in your pocket until needed. 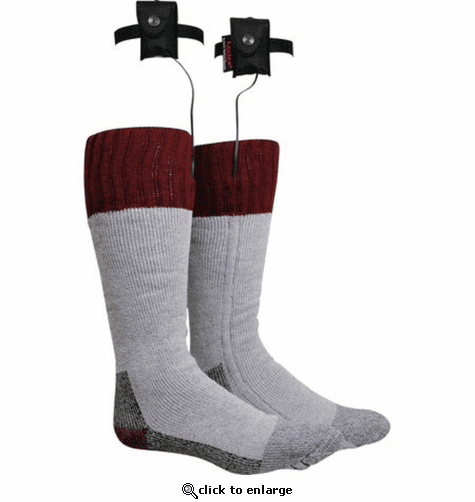 Both socks are powered by a single battery pack that runs on 2 "D" batteries which provides 6-8 hours of comfortable warmth. The extended wire on the wader battery pouch provides easy heat control. Comfortable cushioning in the sole of the Lectra Sox will make these one of the most favorite socks you own. Made with Hollofill high-tech fiber for maximum moisture wicking fabric. Great product! I have raynauds and my feet are ALWAYS cold, especially in the toe area. These socks allow me to enjoy being outside walking my dog, hiking!!! ProsEasy to use. Fair price. Comfortable.. I love these socks. I used these socks for deer hunting. Feet didn't freeze as usual, but they weren't exactly warm and toasty either. Overall they helped, but I was hoping for a little more warmth from them. I would recommend these for use of two hours or less to keep toes warm.